The national festivity of Hari Raya Aidilfitri is here! So I would like to wish all my Muslim friends (Mariuca, LJ, Rizal, Bem, Haaziq, Metz, Hitesh, Fyzal, Shemah, Syura, Rozella, Lily) and my readers Selamat Hari Raya Aidilfitri and happy holidays. For those who balik kampung (travelling home), I wish you a safe and peaceful journey for a very festive Raya. Party hard, but party safe! Thank you Mon for the Hari Raya Wish. 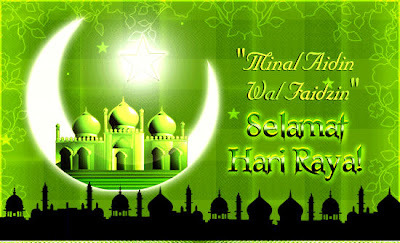 I would like to wish all Mon's Muslim Readers, Selamat HAri Raya Aidilfitri too. I wish for the safety of all who Journey Home too. hehe thanks for wishing Mon's Muslim Readers!! How do you keep up with the party and the blogging and the same time? Enjoy the long Raya break ya. Recent blog:=- What Is It?? Happy Hari Raya, Mon! Sept. 21, Monday, is declared a holiday here in the Philippines in celebration of our Muslim brothers and Sisters of Eid Ul Fitr. It's great to be back here again! I dropped off meows here edi Mon! Yest dropped on important blogs only, less than 200 he he…..
I´m visiting my fellow bloggers...Missed you. Buzz2 if ur up Mon! Wow just a few times up trying to work on one thing ate all of my speed and in the end all was for naught. I still didn't get it all figured out. Wow I am getting desperate here!! I am off now in my eternal quest always trying to get caught up!! I really should be working with these companies and getting some things up for sale. I am waiting for one of them to call me back and answer some questions. But, after almost three days with no dropping and not being able to visit anyone I have no choice today!! But, I was missing everyone anyway. so I am enjoying getting caught up. I just wish I could listen to everyone's videos. But, the satellite that is up is my slow one!! Recent blog:=- anime: spice n wolf (狼と香辛料)..